Many here had predicted an upset. But it was still a shock when it came. This nation, punished by two years of the most drastic austerity measures in modern history, has hit out against the bailout, the political mainstream and the painful cuts that have brought Greece to its knees. A majority of Greeks voted for parties that want to rip up the country's bailout agreement with the EU and International Monetary Fund (IMF) - termed here "the memorandum". The conservative New Democracy and socialist Pasok, which have led a pro-bailout coalition since last November and dominated Greek politics for almost four decades, haemorrhaged support to anti-austerity parties from the left and right. New Democracy still came first but with a dismal 19% of the vote. The big winner of the day was the leftist anti-bailout coalition, Syriza. In the last election in 2009, it scored just 4.6%. This time it took second place with almost 17%, beating Pasok whose support base all but collapsed. And the other big shock is the virulently anti-immigrant Golden Dawn party. Labelled neo-Nazis, their leader was filmed making a Hitler salute on camera, members speaking of racial purity. But now the party has been swept into parliament for the first time in its history, gaining 21 MPs. It is yet another sign of how financial hardship has pushed this nation to political extremes. "I'm ashamed, I'm ashamed", Nasia, a political science student told me, as she digested the news of Golden Dawn's success. "I have no idea what the people who voted for them think but there are now neo-Nazis in parliament." Yiannis, a retired teacher, said he was glad that so many had spoken out against the cuts. "It's positive because now we know what the Greek people want", he says. "Otherwise we'd continue to live in a kind of dream, with little relation to reality. Now we know what reality is." So what next for a country that seemingly lurches from one crisis to the next? Antonis Samaras, the New Democracy leader, has now met the Greek president and has been given the task of forming the next government. He has up to three days to do so and says he is open to co-operation with various parties. But even with Pasok - New Democracy's coalition partner since November - the two parties would fall short of a parliamentary majority, meaning a third anti-bailout party would have to step up. If Mr Samaras cannot form a government, it would fall to the second party - the anti-bailout leftists Syriza - to attempt to do so. It would probably fail to get the numbers too, with the only other possibility being fresh elections. And without a government in place here, the next instalment of Greece's international bailout money would probably be put on hold, raising the spectre of the country's bankruptcy within weeks. In reality, any future government here will have to - at the very least - renegotiate parts of the bailout, following the will of the majority. 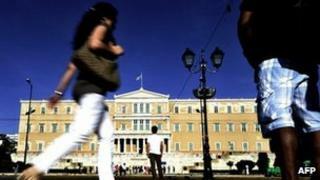 But the challenge will be to do so, while still ensuring Greece's membership of the euro - something a large majority of Greeks want, according to opinion polls. Berlin, the clearest advocate of austerity, has insisted on cost-cutting as a way of keeping Greece in the euro. But there may now be the need for a radical rethink of policy. The international community will struggle to impose yet more austerity here when the cuts have been so comprehensively rejected by the majority of the Greek people. "If the European south unites towards our German friends and in particular Chancellor Merkel, she has to realise that these austerity measures are not leading anywhere", says Konstantinos Mihalos, the president of the Greek Chamber of Commerce. "These horizontal cuts that have been implemented over the past two-and-a-half years have brought us to a dead end. We need to stimulate the economy - you need stimulus, you need growth and we need to re-negotiate certain parts of the deal." Perhaps that rethink will be aided by the election of France's new Socialist President, Francois Hollande. He is sceptical of austerity, favouring pro-growth policies instead - something conspicuously lacking in Greece and yet desperately needed. The wind of change may be blowing from Paris to Athens - and may further embolden those fighting the cuts here. Greece is where the Eurozone debt crisis began back in 2009. It remains where the problems are most acute. And now this country has been plunged into yet another period of intense instability that it - and Europe - can ill afford.